The Power Executive is an innovative, low cost, and intelligent SMS switch that enables you to remotely control and monitor electrical Appliances with text messages from any mobile phone. Ever wondered the status of some equipment after you’ve left the office? Worried about a power outage or brown out? Wished you could turn on the heating or a pump? Well take a look at this product! 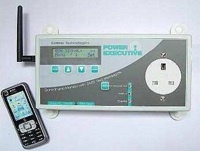 Cottner Technologies have released the Power Executive – a low cost solution to monitoring and controlling electrical equipment remotely. The unit has the capability to monitor the power consumed by an appliance and generate alarms if the power consumed is not within acceptable limits. It can automatically notify you via SMS in the event of a power outage or when power is restored. The system allows you send alarms to up to 5 authorised mobile numbers and has an escalation protocol in the event that an alarm is not acknowledged. Two digital inputs can be connected to peripheral devices and be configured to send alarm messages or turn on/off the appliances connected to the digital outputs. Two digital outputs allow you activate secondary devices and can be controlled via SMS text message or in response to events on the digital inputs or appliance. Cottner Technologies is currently seeking European sales representatives and outlets. The Power Executive is now well know for its versatility in appliance control and monitor markets and they are looking to form partnerships with overseas companies. This entry was posted on Monday, February 22nd, 2010 at 7:12 am and is filed under Applications, Automation, Environment. You can follow any responses to this entry through the RSS 2.0 feed. You can leave a response, or trackback from your own site.